Report by Malaya Mohapatra, Keonjhar: Odisha Police has won the men’s championship trophy , while Jagatsingpur women team won the trophy in the women’s wing in the 6th Pravat memorial Handball Championship held at Keonjhar Park recently. 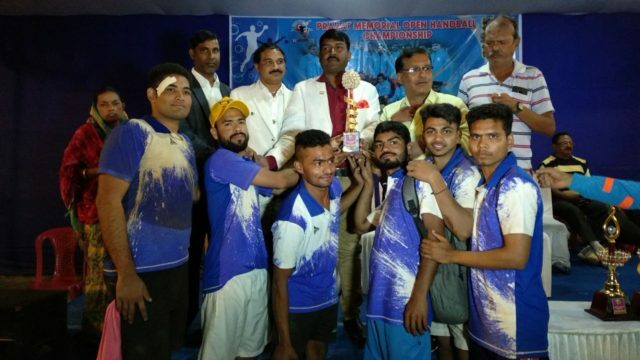 Saroj Sahoo, Chairman Keonjhar Municipality graced the prize giving ceremony as chief guest and Basant Kumar Dani, President Keonjhar Handball association presided over the function. 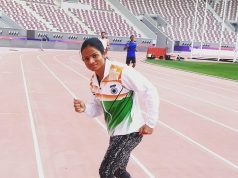 In this all India Championship,Odisha Police defeated keonjhar police by 21-20 goals and Jharkhand mens defeated west Bengal by 20-15 goals to enter the finals. In the womens stream, Jagatsingpur womens defeated the Jharkhand team by 15-12 goals in the final match to bag the champion trophy. Similarly Jharkhand mens team lost the match to Odisha Police 18-22 goals to end up as the runners up team in the mens final.Dushmanta Jena of Odisha police team was awarded the man of the match and Manas sahoo of keonjhar team was declared as the best player of the tournament. 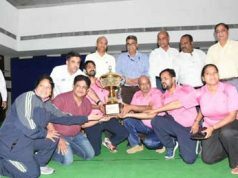 Rotarian Debabrata Swain, Association secy Rithik Adhikary joined the guest is giving away the awards.International Referee Pranay Pani, Srikant Nayak,Prakash Pradhan, Manas Singh,Tushar Kar,Sarojini Sahoo, Mamata Sahoo were among the organizers who managed the three day champion ship. Trophy ,Cash Prizes and certificates were given to the winners.